1. A district in Bashan which was taken from Og by the Jews (Deut. iii. 4), and together with the district of Gilead, was handed over to the halftribe of Manasseh (Deut. iii. 14). One account of the renaming of the land is given in Deut. iii. 15, and another in Judges x. 3, 5. The latter account is to be preferred, since Deuteronomy speaks of Havoth Jair and Argob as identical, and it is known from I Kings iv. 13 that Havoth Jair was in Gilead. The district of Argob has not been located accurately, but a steady line of tradition points to the modern Leja, known to the Romans as Trachonitis, which is the word the Targums use in translating Argob. The land is of lava formation and very rocky; it is separated sharply from the surrounding fertile lands by a line of rocks and stones. This fact may explain the term, "cord of Argob." 2. A place or a person mentioned in II Kings xv. 25. The passage is very obscure. Rashi holds that Argob was the royal palace. Others consider that the name refers to an accomplice of Pekah in the murder of Pekahiah. 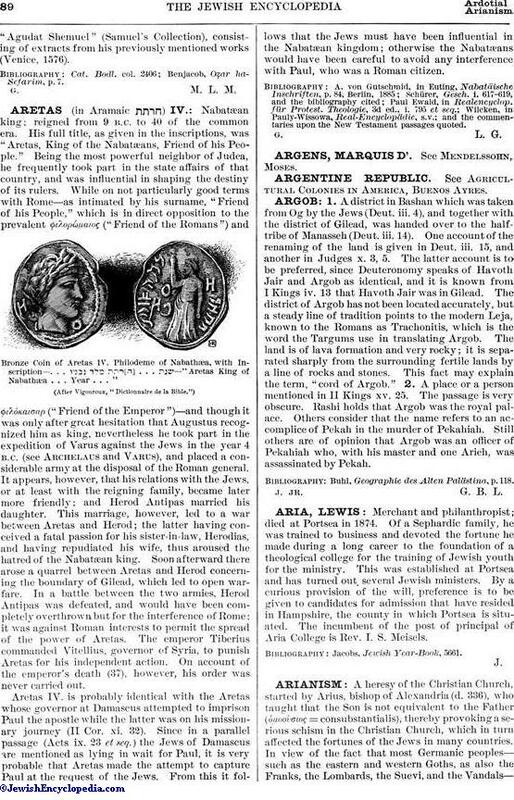 Still others are of opinion that Argob was an officer of Pekahiah who, with his master and one Arieh, was assassinated by Pekah. Buhl,Geographie des Alten Palästina, p. 118.